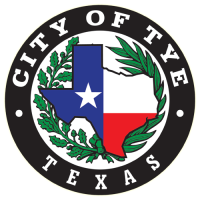 According to the Tye City Ordinance, Article 6.04, it shall be unlawful for any person, firm, corporation, partnership, association of persons, owner, agent, occupant or anyone having supervision or control of any lot, tract, parcel of land or portion thereof, occupied or unoccupied, improved or unimproved, within the corporate limits of the city to suffer or permit grass, weeds, or brush that is uncultivated to grow to a greater height than twelve (12) inches on any lot, tract or parcel of land within the corporate limits of the city, two (2) acres in size or less. On tracts of land more than two (2) acres, it shall be unlawful to suffer or permit grass, weeds and brush in excess of twelve (12) inches in height to grow uncultivated within one hundred (100) feet adjacent to and along any dedicated public street within the corporate limits of the city or within one hundred (100) feet on either side of any lot that is occupied by a residence or business. Any person who shall violate any provision of this article shall be guilty of a misdemeanor, which shall be punishable by a fine not to exceed two hundred dollars ($200.00). Prosecution in municipal court shall be in addition to other remedies provided in this article. In addition to court action, the city may enter upon the property found in violation of this article and mow or have said property mowed at thirty-day intervals during such annual growing season in the event such owner fails to mow same. Expenses incident to the action taken by the city to correct any condition coming under the provisions of this article, which includes a service charge to cover administrative costs, plus a penalty charge of ten dollars ($10.00), shall be assessed against the owners of all outstanding interests in the lot or parcel of land involved. An itemized bill of such costs shall be mailed by the city to each such owner if his address is known. The governing body of a municipality may assess expenses incurred under section 342.006 [of the Health and Safety Code] against the real estate on which the work is done or improvements made. To obtain a lien against the property, the mayor, or municipal official designated by the mayor, must file a statement of expenses with the county clerk. The lien statement must state the name of the owner, if known, and the legal description of the property. The lien attaches upon the filing of the lien statement with the county clerk. The lien obtained by the city is security for the expenditures made and interest accruing at the rate of 10% on the amount due from the date of payment by the city. The city may bring a suit for foreclosure in the name of the municipality to recover the expenditures and interest due. Are an immediate danger to the health, life, or safety of any person. No later than the tenth day after the date the town causes the work to be done under this section, the city shall give notice to the property owner in the manner required by section 6.04.003. An explanation of the property owner’s right to request an administrative hearing about the city’s abatement of the weeds. The municipal court judge shall conduct an administrative hearing on the abatement of the weeds under this section if, not later than the 30th day after the date of the abatement of the weeds, the property owner files with the city manager a written request for a hearing. An administrative hearing conducted under this section shall be conducted not later than the 20th day after the date a request for a hearing is filed. The owner may testify or present any witnesses or written information relating to the city’s abatement of the weeds. The city may assess expenses and create liens under this section as it assesses expenses and creates liens as provided in section 6.04.007. The provisions of this section shall be enforced by the city manager, and it shall be unlawful for any person to interfere with or hinder the building official and his duly appointed representatives in the exercise of their duties under this section. Any person violating or failing to comply with any provision or requirement of this section who continues to violate or fails to comply with such after seven days after notice is given and received as set forth herein, shall also be deemed guilty of a class C misdemeanor and, upon conviction thereof, shall be fined. A separate offense shall be deemed committed upon each day during or on which a violation or failure to comply occurs or continues to occur. Notwithstanding the provisions of subsection (1) of this section, any violation of any provision of this section which constitutes an immediate danger or threat to the health, safety and welfare of the public may be enjoined in a suit brought by the town for such purpose. In addition to any other remedies or penalties contained in this section, the town may enforce the provisions of this section pursuant to the applicable provisions of chapter 54 of the Texas Local Government Code, as amended, which chapter provides for the enforcement of municipal ordinances. Allegation and evidence of a culpable mental state is not required for the proof of an offense defined by this section.